San Diego Comic Con always brings the goods. 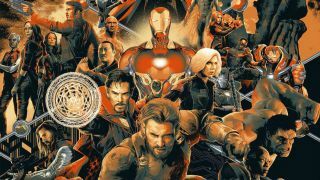 Case in point: Marvel has unveiled an utterly incredible Avengers: Infinity War poster that has to be seen to be believed. Seriously. It’ll be a mainstay of many an MCU fans’ wall for years to come, I’m sure of it. Let’s take a look at it, shall we? You’d best start preparing yourself, it’s a beaut. With Thanos looming large in the background, it’s the best of Earth’s Mightiest Heroes that take centre stage this time. Thor is all revved up and in God of Thunder mode; Cap is all fired up and ready to go and, in the middle of it all is the guy who kicked everything off: Iron Man. Created by artist Matt Taylor, this really does feel like not only the endgame of the MCU, but the endgame of all MCU posters. He’s knocked it out of the park. I’m not normally one to gush about posters, but I’m already mentally framing it in my mind as we speak. There’s a sepia-tinted version of the poster, as well as a more striking red variant. The latter will set you back $80 at the event (booth #435) with only 325 available upon doors opening to the public on Sunday. You’d best be quick! The more colourful copy is going to be available from MondoTees.com for a limited-time only: Sunday 11:30am Central (9:30am PDT/12:30pm EDT/17:30pm BST) until Thursday at noon Central (10:00am PDT/1:00pm EDT/6:00pm BST) should you want to pick that up. It’s only $60 too. For more from the event here at GR, be sure to hit up our San Diego Comic Con 2018 hub for a look at all the exclusives and panels from the event!